October 1940. "Beer signs on truck. Little Falls, Minnesota." Gluek's and Grain Belt on tap. 35mm nitrate negative by John Vachon. View full size. Submitted by Tiki Owl on Sun, 01/06/2013 - 6:38am. The Gluek beer name has now vanished as well. IIRC on the Twins radio broadcast Dan Gladden even advertised for Gluek in the early and mid 2000's. See this. Submitted by Jimmy Longshanks on Sun, 01/06/2013 - 1:24am. All that remain of Gluek's are the silver buildings at left in the street view. They used to be part of the loading docks. 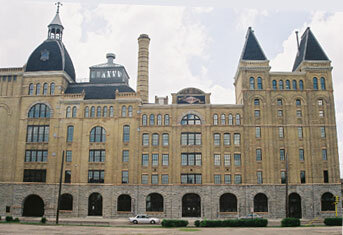 This is a recent look at Grain Belt, now home to architects and a public library. These brewers were about ten blocks from each other. Submitted by Banderboy on Sat, 01/05/2013 - 6:52pm. It looks as though there's no tire on the spare rim. Submitted by jsmakbkr on Sat, 01/05/2013 - 4:32pm. The movie showing in Oct. 1940 at the recently-opened Ripley was "I'm Nobody's Sweetheart Now." The cast was a set of generally forgettable actors, with one exception: Margaret Hamilton, who will forever be known for her role in "The Wizard of Oz" as the Wicked Witch of the West. Ironically, Little Falls was also the home to lumber heir Laura Jane Musser, who would become Margaret Hamilton's biggest fan. As this 2012 article in the local Little Falls newspaper explains, Ms. Musser, who spent much of her life living in a set of wood-framed mansions at 608 Highland Avenue known collectively as "Linden Hill," was deeply into the movie in general and Ms. Hamilton in particular. The socialite visited the set during the movie's production, and eventually she and the former witch became lifelong friends. Now Playing at Ripleys Theater. Submitted by Vintagetvs on Sat, 01/05/2013 - 3:00pm. I'm Nobody's Sweetheart Now, (1940). "In this low-budget musical, two sets of politically ambitious parents attempt to pair up their youngsters who unfortunately despise each other and only pretend to like each other to please their parents." Submitted by wxman1 on Sat, 01/05/2013 - 2:40pm. "The brewery enjoyed modest success until the spring of 1880, when it burned to the ground. Reconstruction was immediately begun, but G. Gottlieb, the founder, was to die that fall. His sons continued the business as G. Gottlieb & Sons, and later as the Gluek Brewing Company. By 1902, the plant was turning out 44 barrels a day. The brewery survived Prohibition but was eventually sold to G. Heilemann in 1964, who tore the place down two years later. The Gluek's label was acquired by the Cold Spring Brewing Company, which today produces beer for the Gluek's restaurant in downtown Minneapolis." So Gluek's still exists, in a manner of speaking. Submitted by TonyB on Sat, 01/05/2013 - 2:24pm. I Must have those signs for my man cave!! Those would be sooooooo cool. Hell, I'd put 'em up on side of house to the annoyance of neighbors. Submitted by Splunge on Sat, 01/05/2013 - 2:10pm. The truck is long gone, but the buildings are still there, as is the light post in the foreground (you'll have to rotate the street view map to see it). Submitted by Ben Roundabloc on Sat, 01/05/2013 - 1:19pm. That Gluek's neon sign must have served as a beacon in the stormy night to many a thirsty soul. Alas, they are no more. http://www.nemplsonline.com/node/1149. The beer was also sold in cone top cans for many years. 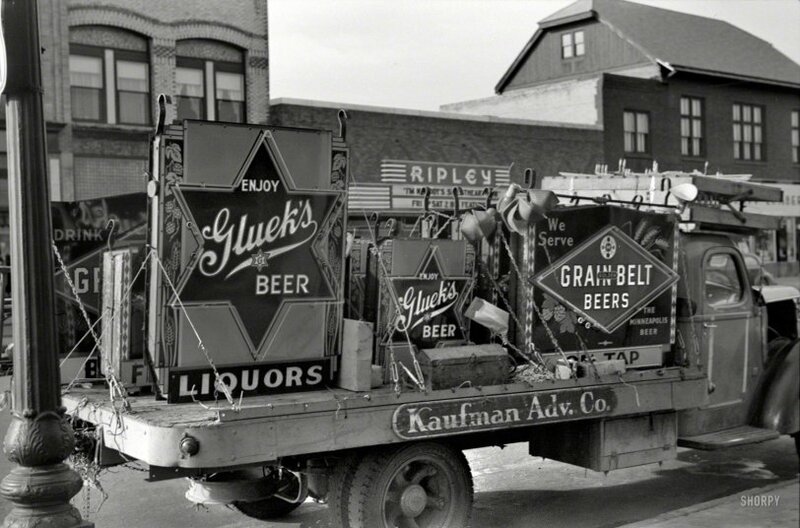 The pull/pop-tab-can generation should Google "Gluek's cone cans" to view this era of the beer delivery system. Some of these old cans are worth more than a loaded iPhone 5 to collectors. Submitted by Paul A on Sat, 01/05/2013 - 12:52pm. Being a kid from Minneapolis, these signs bring back memories of crowded neon over the sidewalk. I think I see a Fitgers sign in the middle. That would make sense because Little Falls is about the same distance from Duluth as it is from Minneapolis and beer was pretty regional in distribution at this time. Submitted by Ice gang on Sat, 01/05/2013 - 12:46pm.